This article provides guidance on how a musician, label or any other content creator can identify a target audience, encourage the most ardent customers to become evangelists, and develop a varied monetization strategy. The article should be viewed as a general overview with certain specific action items. Ten years ago, The Cluetrain Manifesto was published and became the seminal work on the Internet. Like then, the clues, or answers, are found everywhere around us today. The challenge and opportunity rests in the ability to separate the non-value adding “opportunities” from measurable strategy. This article attempts to focus content creators on the latter. In order to find your audience you must consider several details. The first is to accept the fact that you cannot market to the majority; you can’t afford it, and even if you could you would fail because of issues related to frequency of contact with these gatekeepers (i.e. radio/press). Take the Mavens and Early Adopters and focus on these two groups. The Mavens, a term popularized by Malcolm Gladwell in his book The Tipping Point, applies to people who actively and aggressively seek out new things. They are the ones who are not only the most connected to the information channels, but are also most predisposed to discover new things, and new channels as well. These mavens have a personality type that generates deep satisfaction from not only the seeking out and discovery of new material, but also the sharing of this material. The first class of people with whom they will share are so-called Early Adopters. 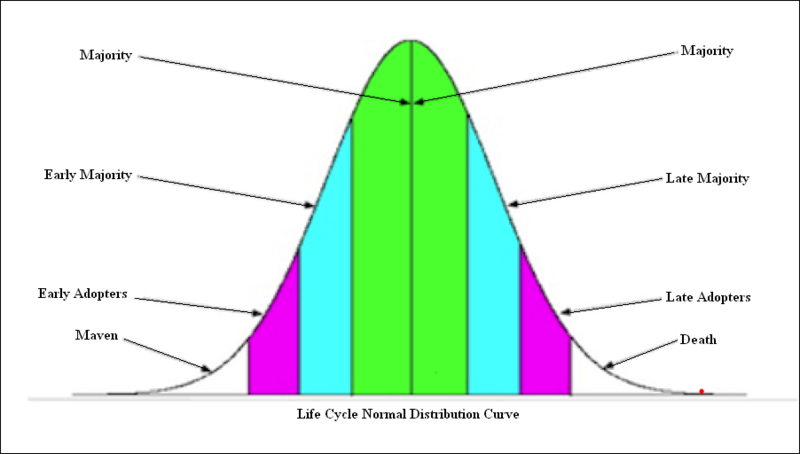 These Early Adopters are one standard deviation closer to the majority than the Mavens, and thus there are more of them. However, while they will adopt new things more quickly, they are not typically at ground zero of discovery. If the mavens are the bloggers, the Early Adopters are the readers of these blogs, and — to a degree — the re-bloggers. Again, these Early Adopters are a more populated class, and thus their influence is potentially greater than the Mavens. There is crossover between the two groups. 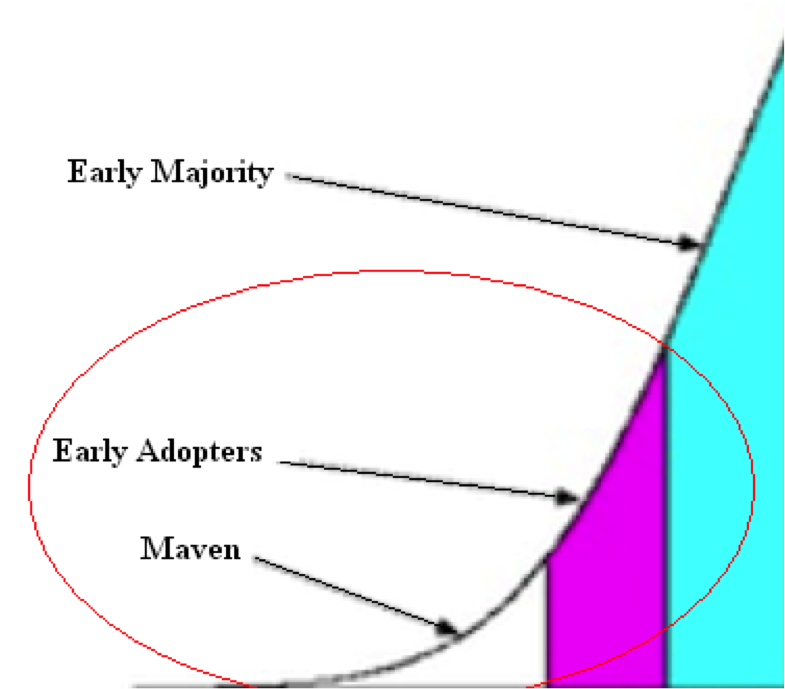 In every product category there are Mavens and Early Adopters. Whether you are dealing with music or any other product or service, you must find a way to bring your product to both groups. In an era of interconnectivity, demographics and geographics, while still important, are less important than the habits, trends, personality of a customer; i.e. their psychographic profile. Finding your audience requires you to understand profoundly the psychographic profile of your customers. What do they look like, where do they shop, what type of food do they like, etc.? Determining these factors allows you to create a “model” customer. This is the person who, if you could get your music to her, would deeply embrace it. Also, given the fact that she is a Maven/Early Adopter, she will likely share what she has discovered with her network. Significantly, defining this Model Customer allows you to determine where this customer is likely to congregate, and thus where you must bring your music. We do not make profound connections with products, services or people online. Profound connections occur offline — in person. The genius of Facebook, and why it has eclipsed networks such as MySpace, is that it represents a Straddle of offline and online; we upload pictures and detailed stories of our offline activity so that our friends and family can be aware of these offline experiences. In this manner, you must understand that technology is simply an accelerator of your offline activity. By locating the Mavens/Early Adopters within your psychographic landscape, and taking your music to them — in person — you greatly increase the odds of these people developing an emotional attachment to your work. One of our most primal urges is to share information; this is why babies make the massive cognitive leap to learn language skills. Your job, once the initial offline experience has been established, is to create an architecture of participation; a method for frictionless sharing of information so that those Mavens/Early Adopters who have discovered you offline can begin to share their discovery with their network (i.e. online). On your site you must present a value proposition that begins with exchanging some type of content for an email address. Email is your currency; the more of it you have, the more likely you will be to convert what is essentially a non-scarce resource (i.e. your music) into something of tangible value. Do not be fooled into thinking you can get away using a third-party site as “your” site. While, undeniably, service providers such as Reverb Nation and Bandcamp provide value, you do not own these sites, and fundamentally your participation does more to increase the value of these sites than increase your own value. This is not to say you cannot extract value from these third-party sites; however, this requires using them like Facebook, Twitter, and others, to drive potential customers to your own proprietary site. Your FB fan page, similarly, must also represent a value proposition. The value here relates to engagement. FB allows for easy engagement via its makeup. Consider contests, polls, short videos, or other ploys that will keep your fans not only engaged with you on FB, but will encourage them to direct those in their network to your FB fan page. Of course, you must use FB to direct customers to the value proposition that exists only on your site: a content-for-email exchange, and other site-specific offerings (chats with the artist, etc.). Twitter should be used to establish your voice and to direct people to your site. The establishment of the voice comes as much from your affiliations — who you link to, who you follow — as it does from your actual tweets. As above, use it to engage and to direct traffic to your site. Employ time-sensitive offers and offers only available to those who follow you on Twitter. The goal is to inter-connect these tools, and to leverage them to enhance the offline experience. In all mediums you must encourage and facilitate sharing. Your site must have a FB “Like” button and a share on Twitter so that whenever you post content, your constituents can share with their network. The single best tool for conversion of fan to customer is email. While email is an increasingly ineffective tool for communication it still yields a higher return with respect to sales than any other tool. 1. They must be short; highlight one and only one action. The total length should be less than 500 words. 2. They should be frequent; once a week on a regularly-scheduled basis. 3. They should have a call to action; tell the recipient what you want them to do: come to the site to get something, come to a show, etc. 4. They should be forwardable; ask your recipients to forward the email to someone they think will enjoy it. 5. They should have sharing functions embedded; allow people to Tweet, add to a FB status. 6. Make it easy for people to unsubscribe. Don’t worry about overwhelming people with email blasts. If people are unsubscribing, they’re likely non-value adding “fans” any way. Instead, focus on presenting real, timely, share-able value to your current fans so that they have a tool to help you gain new ones. It is an immutable law of business and nature that somewhere close to 80% of your activity (engagement, profit, etc.) will come from 20% of your constituents. This is referred to as the Pareto Principle or the 80/20 rule. This means that if you have 10,000 people on your email list something close to 2,000 of them will generate 80% of your total sales. The other 8,000 will be largely non-value adding. The problem of course is that you won’t know which of the 10,000 are the true fans. Thus, you must continuously work to increase your overall amount of constituents. Rather than having 2,000 of 10,000 contributing, strive to have 20,000 of 100,000. In order to sift through the layers of participation to find the most valuable customers, you must create a filter. Think in terms of a funnel. 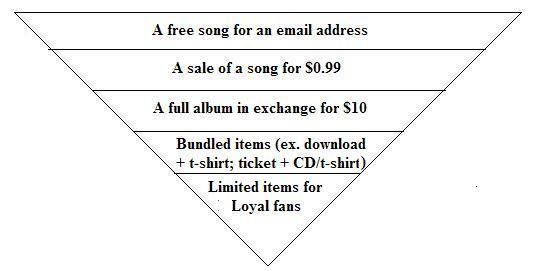 At the widest point of the funnel is the easiest level of engagement: a free song for an email address. One layer down on the funnel suggests a slightly more expensive level of engagement; perhaps the sale of a song for $.99. You will have less people who engage in this offering than you will those who engage in the free content in exchange for an email, but this is OK because you are generating a higher margin (or, in this case a margin). A layer below this level of engagement should be a more expensive value proposition; perhaps a full album in exchange for $10. Again, you will have less people who engage in this offering, but you will make up in margin what you lose in volume. Below this is where you start really separating your casual fans from your true fans. Here you’ll begin bundling things together, and adding more non-standard offerings. For instance, you might offer a download with a t-shirt package; or a ticket with a CD/T-shirt. These will obviously appeal to a smaller pool of people. However, it is important to note that these options represent the opportunity to not leave money on the table. That is, there are always fans who are willing to spend more, but are not given the opportunity to do so. By providing a range of offerings, you go a long way towards making certain you provide the maximum value to the customer while also increasing your revenue generating possibilities. The final layer should be for the über fan. The fan who wants something that others can’t have. This tends to be scarcity. Signed, limited things, and, of course, access to the artist. These are the highest margin related items because they cost the artist little to no extra money with respect to cost of goods sold, but they are nearly invaluable to a customer. For instance, it takes nothing but a bit of time for an artist to sign a CD/poster/t-shirt, but it increases the value to the customer exponentially. You must find ways and products that increase value for the customer, but cost you, the artist, no additional expense. The key is to determine what you deeply care about; what your purpose is, what your values are. From there you can begin — via a psychographic analysis — to find fans that share these same values. At that point, your goal is to bring your music to them, and create the architecture for more participation. Straddle between an offline and an online engagement strategy, but use both. Once you’ve aggregated these Mavens and Early adopters, you must begin converting them into both customers and evangelists. This is done by honoring the 80/20 rule and working to extract maximum value out of your loyal 20%. Always work to increase the overall pool of your fans. Prev YouTube: The New Radio Star?